This game has anti-piracy features. There appears to be some evidence that the extended string in Fever from the Game Boy edition is in the game, but is unused. 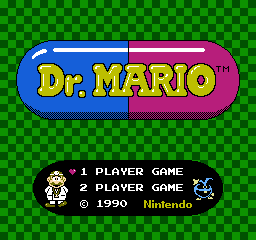 Dr. Mario is a puzzle game featuring Mario, who throws colored pills into a bottle to match with like-colored viruses and destroy them. It's also been remade several times since. These sprites were intended to appear in the cutscenes shown between levels. Either a soccer ball or a meteor. Nobody knows. A snowman in boots? Whatever it is, it does have a proper tilemap and behavior, and its placement in the sprite list suggests it was meant to appear in the Level 20 HIGH cutscene before the final UFO scene was implemented. Some strange colorful lines, possibly an early virus-deletion animation. The final game uses a much simpler starburst graphic. This sprite appears in later prototypes of the arcade version. What seems to be half of a giant pill. This was added sometime after the PlayChoice-10 Virus prototype. The game has two leftovers from its earliest days of development, when it was called Virus. Normally, Megavitamin halves fall down after the other halves are matched. In the first two builds of Virus, the options menu allowed players to turn this off, letting them stay in mid-air. In any version of the final, changing RAM address $724 to a non-zero value will cause the Megavitamins to stay in mid-air. Normally, 2-Player mode continues until a player wins three times. In the first two builds of Virus, this number could be set in the options menu. Similar to the above, the number of games needed to win can be changed at RAM address $725. The game features a simple anti-piracy check that will intentionally crash the game if the title screen is altered. On reset, the game performs an 8-bit checksum of the area of ROM containing the title screen tilemap data ($B900-$BDFF). If the check passes, RAM address $740 is set to 00 and the game runs normally. However, if it fails, $740 is set to FF instead. This address is checked whenever a pill lands; if it's set to FF, the game pulls whatever value is stored at RAM address $53, pushes it to the stack three times, and performs an RTS. This causes the CPU to jump somewhere in RAM, and since there's no valid program code there, the game soon crashes. Interestingly, a very similar 8-bit checksum routine (and method of crashing) appears in Final Fantasy. Perhaps the programmers drew inspiration from NASIR? This page was last modified on 18 November 2017, at 18:10.